Microgaming has a way of making a name out of any developer they team up with – enter Mahi Gaming. This partnership resulted in one heck of an interesting keno game now widely available at our recommended keno sites and as pushed the provider into the spotlight. While there aren’t many other titles available which we know about yet, nor is there much information on the provider, we’re sure it won’t be long until Mahi Gaming becomes a household name. There isn’t a whole lot known about Mahi Gaming – not on the web anyway. The software developer is quite sparse online with no website available. This could be due to its name only beginning to be mentioned in mid-2016. We dug deep and found the provider only filed for a trademark license in November 2016 – so this provider is incredibly new. The provider garnered the most attention when it was revealed Microgaming had teamed up with the provider and had released a keno variant – it isn’t often a new keno variant is made available on the web so we all wanted to know as much as we could. Interestingly, creating and releasing a keno variant isn’t the only time the provider has had help from Microgaming. Mahi Gaming released Electric Diva, their first online pokie back in in July, 2016 with the help of the huge software developer. Another release between the pair is the pokie Shanghai Beauty and we can only expect more titles to come. The developer doesn’t have a website or any more information available at the time of writing, but the more releases it makes, the more attention it will get and we will keep you updated with any information on the provider here. Since this developer has only come onto the scene in the second half of 2016, there’s not too many variants on offer. But the one keno title the developer has released is quite interesting. 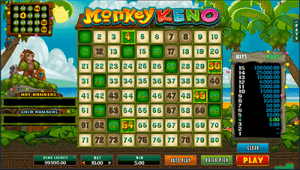 If you enjoy a traditional game of keno but want to change it up a bit Monkey Keno is a good title to start with. It features standard gameplay, but the theme is set in a jungle with a bunch of cheeky monkeys throwing fallen coconuts once you commence the game. Mahi Gaming has created an 8×10 grid and stuck to low stakes on this title with a minimum bet of $0.10 available and a maximum of $10. Adjust the size of your bet to get started and then click up to 15 numbers out of the 80 available. QuickPick is also available. Click Play and the monkey will start throwing coconuts onto their corresponding numbered spots and any winning spots will light up orange. You will be able to see how much you can win, and how much you have won, via the paytable to the right of the game screen. The payouts vary according to the number of spots chosen. On the other side of the game screen is the Hot and Cold numbers, which are the 10 most common and 10 most uncommon numbers – these are only relevant after you’ve been playing for a while. Is Mahi Gaming keno safe? Since the provider is so new and there’s little to no information available one the web, it can be understandable if you’re hesitant to want to play Mahi Gaming’s titles with real money. We would be sceptical too, except for the endorsement from the reputable provider Microgaming. This provider has been around for two decades and has made a name as the best in the business. To jeopardise it’s reputation with a no name provider would be silly – and that’s something Microgaming isn’t. Mahi Gaming games would also have to be tested to ensure they are fair and are up to Microgaming standards to be launched on the Quickfire platform, ensuring the keno variant and other Mahi Gaming titles are safe to play. Find Monkey Keno at All Slots Casino. Although there isn’t much information about Mahi Gaming, the Monkey Keno variant is widely available online. 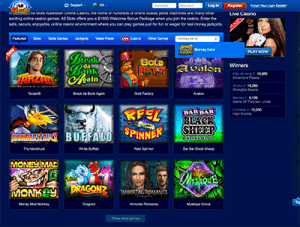 All of the keno sites listed in the table above offer the entertaining casual game for real money. To get playing Mahi Gaming’s titles you can head to one of these online casinos – click their links and you will be directed via your browser. If you are a Mac user you can access the games this way, while PC users have the extra choice of downloading the online casino. Sign up with your details and activate your account by clicking the link sent to your allocated email. From here you will need to make a deposit so you can have the chance of scoring real money payouts on the keno title. Available payment methods for Australian keno players include Visa, MasterCard, and other credit and debit cards; Skrill, Neteller, ecoPayz, and more e-Wallets; as well as prepaid vouchers such as paysafecard and Flexepin. You can also make a bank transfer. All transactions are protected by encryption technology so you can safely get playing Monkey Keno by Mahi Gaming. Head to All Slots Casino to play real money keno by Mahi Gaming and score a $1600 welcome bonus as a new player.